The Epson Expression Photo XP-850 Small-In-One Color Inkjet Printer outputs photo-quality prints at 9.5 ppm in black and at 9.0 ppm in color. The 6 Claria Photo HD ink cartridges team up with the small 1.5pl minimum ink drop to produce high quality photos and documents. Despite its small footprint, the XP-850 has multiple connectivity options. 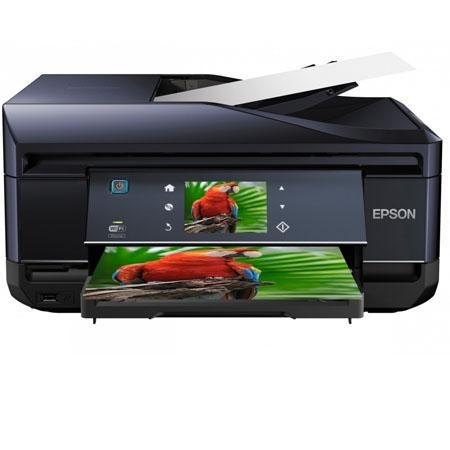 Its Wi-Fi and Ethernet connectivity enables printing and scanning over a wireless or wired network, while Epson Connect lets you print directly from a mobile device. Additionally, the printer is compatible with both AirPrint and Google Cloud Print. The printer's built-in card reader and front-facing USB port let you print from and scan to a memory card or USB drive. 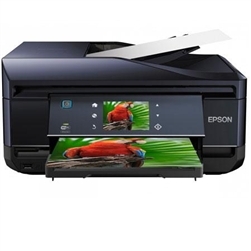 Easily navigate through the printer's options using the 3.5" LCD touchscreen. The built-in 30-page automatic document feeder lets you scan, copy and fax multipage 2-sided documents in 1 easy step. Scan documents and photos up to 8.5 x 11.0" (letter size) and save them to your computer. You won't have to worry about losing important papers or photos. With up to 4800 dpi scan resolution, red-eye removal, photo restoration and exposure correction, you can easily scan, fix and share old photos right from your computer. The built-in fax modem lets you send and receive faxes from the machine itself or send faxes from the computer. The XP-850 includes a 180-page memory so you can receive faxes even when the printer is out of paper. Additionally, you can save up to 60 numbers in the fax's speed dial. The copier lets you scan documents up to 8.5x11" in color or grayscale. There's no need to turn on the computer to copy a document, photo, ID card, or passport; just use the printer's touchscreen LCD to copy, change the copy quality (draft/normal) and specify how many copies you need. Paper Sizes Letter, Legal, Half Letter, A6, A4, 16:9 wide, 3.5 x 5.0", 4.0x6.0", 5.0x7.0", 8.0x10.0"